Laminate Floors come in either planks, or squares and are designed to replicate real flooring materials, such as wood, stone or ceramic tiles. These floors are composed of several different layers of various materials sandwiched together to form the plank. A printed film (Photo Finish) gives the floor the look of real wood, stone or tile. The protective layer consists of Aluminum Oxide. This resign used in the wear layer is said to be almost as hard as diamonds and provides unsurpassed wear and stain resistance. 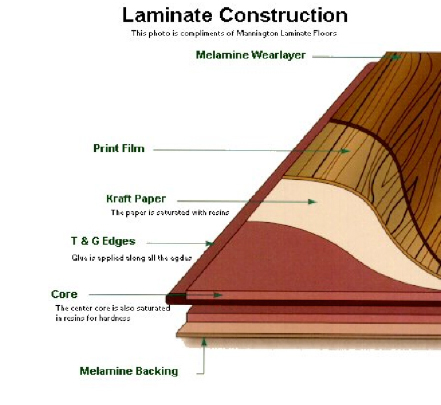 The core and tongue and groove system of laminate is generally composed of low destiny fibre board (LDF), medium density fibre board (MDF) and High destiny fibre board (HDF). The core is also the base that all the upper layers and the backing materials are fused to. Core - generally composed of low density fibre board (LDF), medium density fibre (MDF) and High density fibre board (HDF). The core adds impact resistance, and forms the tongue and groove locking system. While the strength of these floors are comparable to formica kitchen counter tops, they offer many added performance features. Laminate floors have a durable wear layer finish to help protect your floor from scratching and chipping. Laminate floors originally came from Europe where they have been used in homes for over 20 years. Although most laminate floors are imported, a few brands are produced in Canada and the U.S.A. 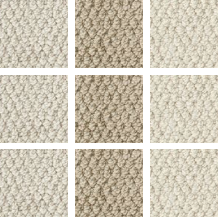 The performance, price and durability of each floor differs based on the components used in the manufacturing process. Even though these floors resemble real wood floors they are not wood. Wear layer - is a tough clear melamine layer with aluminum oxide particles. Using heat and pressure the wear layer becomes an incredibly hard and durable finish. The resin-filled wear layer is so dense it becomes extremely tough and difficult to stain, scratch, or burn. Underlayment - is a clear thin plastic sheet that is installed over the substrate before the laminate floor is floated. The plastic sheet helps the laminate floor to float freely above the substrate.